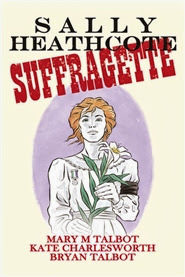 Sally Heathcote, Suffragette tells the story of one woman’s involvement with the suffrage movement, from 1912 until the start of WW1 two years later. The narrative is framed as a flashback from an elderly Sally: in 1969, she’s in a Nursing Home and looks back on her life as her daughter and granddaughter visit her. This set-up is used to moving effect, as it highlights both how far women have come in this regard and how dangerous it is to take progress and the fight for gender equality for granted. Sally is a fictional character, but her story is closely based on real events. The book is well researched, rich in detail, and full of cameos by historical figures. When we first meet Sally, she works as a maid in the Pankhursts’ Manchester home; after moving to London, she becomes involves in the campaign for the vote herself. I really like the fact that Sally Heathcote, Suffragette is centred on a working class woman: like Jill Liddington’s Rebel Girls, it challenges the idea that the struggle for progress and equality is imposed on the masses by the elite. This story shows us that “96,000 organised women cotton workers” were just as committed to getting the vote as upper- and middle-class women. Women of all classes cared, organised, and fought — sometimes separately, sometimes side by side. The idea that progressive values are imposed top-down (which is similar to the media narrative surrounding anti-racism today, as Daniel Trilling addresses in this piece) is patronising and easily dispelled by facts. Unfortunately facts don’t always seem to have much bearing on the kinds of historical myths that gain prominence, which is just another reason why it makes me happy to come across stories like this. Of course, none of this is to say that there were no class tensions within the suffrage movement. Some working class women rightfully felt that their fellow fist wave feminists were only interested in “Votes for Ladies”: while some suffragettes wanted to challenge the link between the right to vote and property and income, others were happy to leave it at that. 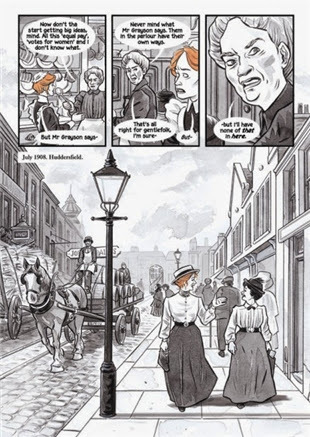 One of my favourite things about Sally Heathcote, Suffragette is the fact that it depicts internal dissent within the suffrage movement with thoughtfulness and nuance. We meet a cast of characters whose commitment to militant action varies, who have different priorities and interests, and who belong to different sub-movements. This is too smart a book to ever dismiss any of this as “in-fighting”: instead, it shows us that people are individuals, that every political struggle is multifaceted, and that agreeing on one issue (that women should have the vote) doesn’t mean you’ll necessarily agree with everyone committed to that fight on everything else. These women often disagree about tactics, socialism, workers’ rights, pacifism, etc, and understanding their dissent was part of what made this book so interesting. 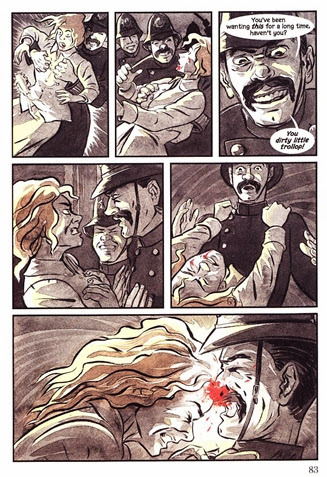 The art in Sally Heathcote, Suffragette is stunning and the book is gorgeous to look at, even if some of what it depicts is upsetting. 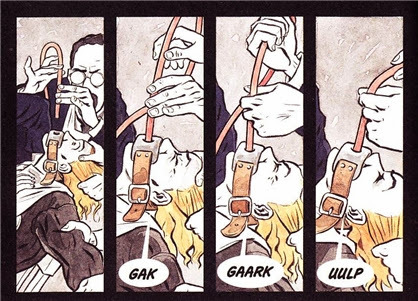 Some of the most striking panels are the ones that detail Sally’s imprisonment and force feeding. I also loved a panel that juxtaposes images of police brutality with newspaper headlines of the time. The last thing I want to say is that I appreciated the fact that the process Sally Heathcote, Suffragette portrays feel familiar. Our goals are different today, but this is how the fight goes. Reading this book was a reminder that feminism has come a long way and still has a long way to go, but none of that means it’s not doing okay. You can see more of the art at Mary Talbot’s website. Ah, I just answered my question as I immediately went to go put it on my wish list on Amazon :p It's not even out in the states yet, so yes it's new, lol. Look forward to reading this one when it comes out! This sounds fantastic! I am reading The Rebellious Life of Mrs. Rosa Parks right now (who was one of the most amazing and inspiring people ever), and the book discusses the classism of the civil rights movement as well - for example, there were at least two other people who could have been used as examples for starting the bus boycott, but they were deemed too low-brow. Rosa Parks was not quite middle-class, but she was deemed worthy of supporting.